Mike Tayloe (right) demonstrates how a SAM Splint can be molded into a cervical collar in the field. You wouldn’t use a 5-weight for muskies, just like you wouldn’t take a saltwater-specific fly-fishing course to improve your trout-stalking skills. Sure, they both may work, but there are more appropriate options. The same goes for your first-aid training. If you are going to do it, why not find a course that is going to benefit you (and others) the most? Believe it or not, there are options out there for first-aid training, including courses that are specifically designed for the environments and locations where we work and play while chasing sportfish. The best option for what we do is Wilderness First Aid. What is a Wilderness First Aid course and why may it be more appropriate than a standard First-Aid course? First, you should know that I am biased–not because I own a company that teaches wilderness medicine courses specifically for the angling community, but because I have spent the last two decades as a paramedic specializing in wilderness and remote medicine and have responded to emergencies on the same rivers I guide on for nearly as long. I can say with confidence that folks who have taken a Wilderness First Aid course have a better handle on emergency situations when help is delayed. To understand why, let’s look at the difference between a standard first-aid course and a wilderness-focused one. Standard first-aid courses are great for the kinds of situations that they are designed for. Most standard first-aid courses are taught with the assumption that rapid professional medical response is an option. The training is focused on recognizing common life-threatening emergencies and managing them until emergency services arrives quickly. This is a good thing and, without a doubt, saves lives. But what do you do if help does not show up in 10 minutes? What if the emergency does not follow steps 1-2-3 that you learned? What if something happens that is not covered in a standard first-aid course? And what if, god forbid, help is not coming, and you need to handle it all on your own? This is where a Wilderness First Aid course differs and may be more appropriate for folks who are fishing in places where 911 is not an option. For many anglers, much of their time on the water is spent semi off the grid. That is one of reasons we play this game. Cell phone service may be limited, and even if you do have a few bars, unless you are fishing in downtown Denver, emergency services are going to be delayed because of your location. Wilderness First Aid is based on the notion that you’ll have to handle a lot more without outside help. Don’t be confused, though: these courses do not teach you to use a beet leaf on a cut instead of a Band-Aid and antibiotic ointment. Wilderness First Aid is based on evidence-based medicine and current first-aid practices. The basics are same as a standard first-aid course–stop the bleeding, open the airway, and consider a head or spine injury–but there’s a heavier focus on the “now what”? Depending on your location, you may have to manage that situation for 30 minutes, 3 hours, or 2 days. A Wilderness First Aid course goes beyond the 10 minute mark and prepares you to handle these situations for extended periods. Believe me, 45 minutes with your severely injured buddy or client seems like an eternity, and a lot can happen during that time. Critical thinking is key in these courses. Thinking through a problem and actually knowing what to do is paramount, and that’s a focus in Wilderness Medicine courses. Wilderness First Aid courses cover, in great detail, the recognition and treatment of environmental emergencies; hypothermia, heat emergencies, altitude related issues, lightning and water-based emergencies. Other than trauma, these are some of the things we see the most in our fishing environment. Wound care is another difference. A Wilderness First Aid course focuses on avoiding (or recognizing) infection and promoting healing. This may not be so important on a day trip on your local river, but it’s imperative on a two-day float or a week at a lodge in Alaska or The Bahamas. These courses go beyond just rinsing off the cut and putting a Band-Aid on it. When an injury occurs in the field, it pays to have the proper tools and materials. Common medical problems–such as abdominal pain, nausea, vomiting, chest pain and breathing issues, to name a few–are also covered. Again, recognition and what to do about these issues is important and rarely talked about. When a non-traumatic medical problem occurs on a trip, you need to know what to do and when to “push the red button” that calls for the helicopter. Of course, you’ll also learn to recognize fractures, sprains, and strains, as well as how to stabilize these injuries. Another cool and important difference between standard and Wilderness First Aid courses is you’ll learn how to self-rescue and move injured or ill folks. Traditionally, we are taught not to move an injured person unless absolutely necessary or you have the training to do so. This is good advice. But when you are hours or days from help, it may be necessary to move someone to safety, out of the water; god forbid have to carry them all the way out to help, but it’s possible. The decision about when and how to do this can be difficult, a wilderness course will teach the critical thinking skills you’ll need to make the best decision. This brings me to, in my opinion, the most important difference between a standard First Aid course and a Wilderness First Aid course: hands-on scenarios and practice. 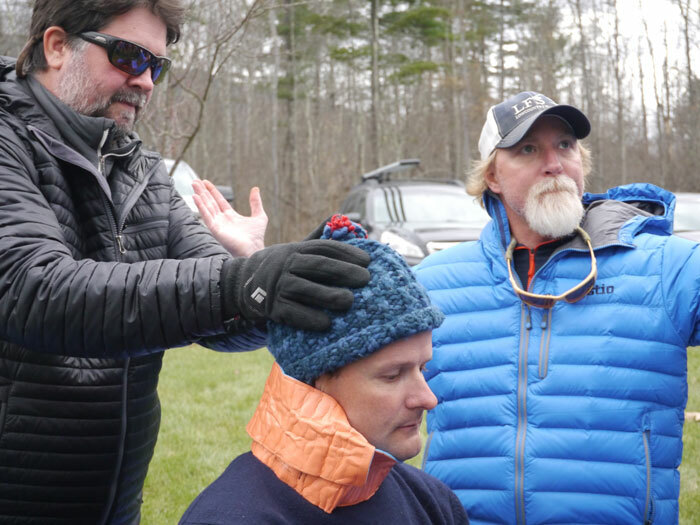 For the most part, Wilderness First Aid courses focus on practicing skills and working through scenarios that are relative to where we work and play. You can read about, be told, and be shown how to handle a particular medical issue, but until you create a mental snapshot and tactile practice, it’s just information. When an emergency occurs, everyone’s stress levels go up. Trying to remember steps you have been taught without hands-on experience is difficult. Let me be clear. A standard First Aid course is good, and the information and skills learned in these courses can and will be beneficial in an emergency, even when help is delayed. But there are limitations and better options for what we do and where we do it. Mike Tayloe, of Finns West, has been a paramedic for more than 20 years, focusing on remote and wilderness medicine, and he has provided remote medical services from Mount Everest to Antarctica. He’s also a fly-fishing guide in Colorado and Chile. Very happy to see this topic. If you venture into remote settings it is imperative to have some level of emergency medical know-how and equipment. Besides keeping something from turning horribly wrong you develop awareness of risk to hopefully prevent an injury from occurring in the first place. You have to assume there will be no one to come save you. Nothing replaces preparation. Your brain is the most valuable tool you take into the outdoors. An option for getting training is the National Ski Patrol’s Outdoor Emergency Care (OEC). I have been a paid Ski Patroller for 36 years and my training has been invaluable during the off-season with working in the Northern Maine Woods. If you do not get the training and venture way out you better have someone with you that has the training/equipment. I thought that this article might have some useful information that I could take to the stream when I go fishing. I kept reading for some facts – all I got was a commercial for his class. The point of the article is not to teach you wilderness first aid. That would be impossible in a blog post. Tayloe’s point is that you should seek the right course that can teach you what you need to know. This is a national blog. Obviously, the vast majority of folks aren’t close enough to take his course.